If you have kids, you know how pricey diapers can be. And the high cost means a lot of families simply can't afford to buy enough diapers. In fact, Tampa is in the top 15 cities for diaper need. That's why a group of local organizations and now the White House are trying to bridge the diaper gap. Katie Phelps is a mom of two toddlers, one still in diapers. "Oh my goodness. The newborns, whew! They go through like, I feel like every hour you're changing a diaper," said Phelps. And just one diaper costs an average of .33 cents. If your baby goes through 10 a day, that's roughly a $100 a month. "People don't realize there's no government subsidy that covers diapers for some of these struggling families. So that's one of those things they really can't go get a lot of help with," said Phelps, a board member with Babycycle. That's why places like Babycycle in St. Pete are so important. It's one of only two registered diaper banks in the Tampa Bay area and supplies up to 10,000 diapers a month to partner agencies in the community. Donations of newborn diapers help a lot, but shelves for the bigger sizes are almost bare. "The demand is so high, we are really struggling to keep up," said Phelps. Now, the White House is stepping up to the plate to help address what it calls the "diaper gap" by working with online retailer Jet.com. The website will soon start offering economy diapers called Cuties at a bargain price, averaging .17 cents, up to a third less than regular diapers. 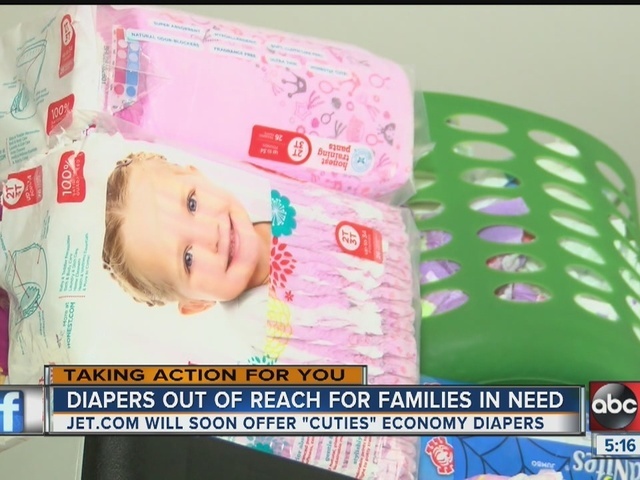 Organizations that distribute diapers can sign up for a community partnership--to get the diapers even cheaper..helping donated dollars go further. "That would be fabulous because now all our donations come through fundraising efforts and really it's the churches and the schools in the community that do drives for us," said Diane Pecchie with Foundations of Life Pregnancy Center. You can learn more about the new affordable diapers at jet.Com/jetcares, and to find free diapers near you, head to nationadiaperbanknetwork.org .